The gastrointestinal tract in cats, just like in humans, contains quite a bit of bacteria – some of it good, some of it bad, and a balance is needed between the two. When the bad bacteria start outnumbering the good, it can compromise the immune system and cause infection. To maintain the balance, probiotics can be taken on a regular basis to help prevent your cat from becoming sick, and possibly even help directly during bouts of diarrhea. And just like people often get their probiotics from yogurt, there’s FortiFlora for cats. 2 What is FortiFlora for Cats? Probiotics are live microorganisms, the good kind of bacteria that the gastrointestinal tract needs to continue functioning well. When the probiotics reach the digestive system, they’ll help boost the immune system, ward off germs and disease, as well as help filter out harmful environmental toxins. When taken orally, veterinarians and researchers agree that probiotics can help with diarrhea, inflammatory bowel disease, malabsorption, overproduction of bad bacteria, and other digestive problems. 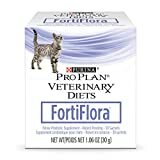 What is FortiFlora for Cats? Cats that are given FortiFlora are also said to have a generally improved appearance, have more energy, and are overall healthier-looking than before they started taking the supplement. This means that unknown animal pieces will be in FortiFlora, a concern for those that want to know exactly what their pet is eating, or want to give their pet a vegetarian diet. While animal digest won’t cause any issues or side effects, it is important for cat owners to know that it is found in FortiFlora. FortiFlora comes in small packets, usually 30 to a package; each small packet contains about a half teaspoon of FortiFlora. The typical dosage calls for just one package to be sprinkled over your cat’s food, although larger cats might require more and other cats might need less. It’s for this reason that if you’re going to give your cat FortiFlora, you must speak to your vet to determine the right amount for your cat. Also, if your cat has any condition that is currently compromising your cat’s immune system, your vet may want you to stop administering FortiFlora, or wait until your cat is better to start them on it. Some cats will eat FortiFlora along with their regular food willingly, while others may balk at the taste and smell of it. Those that mix FortiFlora in with their cat’s wet food seem to have better success administering FortiFlora than those who simply just sprinkle it over top of dry food. Just like any probiotic, FortiFlora for cats can take some time to start working, so don’t be concerned if you don’t see changes in your pet right away. While minor improvements might be observed during the first few days, you’ll really start to see the full effects of FortiFlora after your cat has been on it for a week or two. A vegetarian diet is mentioned but cats Must Not be put on vegetarian diets! They are Obligate Carnivores. Please clarify this in the article! If the taurine in Fortiflora can replace the required meat, then deciding not to use Fortiflora because of the meat would still leave the cat without the required taurine and the cat would sicken and die! Thank you. Well said, I was taking this article seriously until I read that about cats on vegetarian diets. That’s just plain neglect/abuse. Humans fine, cats NO! My cat is one year old, a Ragdoll and weighs almost 12 lbs. He has been checked by our vet and they find no reason for “Sunny” to have diarhea and suggest using Fortiflora. So he is getting one packet per day and has no problem eating it mixed with his canned food. However, he still gets soft stools. Can I safely give him one pkg. In the am and one pkg. again in his evening meal.? Or is that too much? Help..